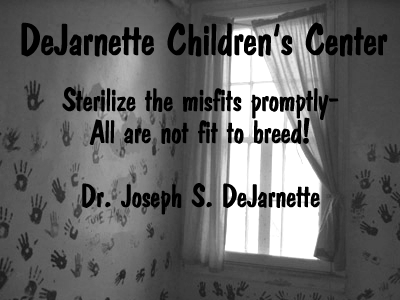 This website is is a tribute to the DeJarnette Children's Center, which is scheduled for demolition sometime in 2007. This beautiful and historic building will be torn down to make way for a shopping center. My website provides information about the DeJarnette Children's Center through photographs, text, and documents. Much of my information is based on an old DeJarnette Center program guide that is from September 1, 1983. It has a handwritten notation that it is revised and throughout the guide are suggestions for changes that should be made. I also have other DeJarnette documents such as patient records and invoices. Most of these are also from the 1980s. For privacy, I have edited the patient records so that the first name and first initial of the last name are visible. The information gives insight into what the DeJarnette Center was like. I have always had a fascination with old and historic buildings and I enjoy exploring and taking photographs of these abandoned places. I also enjoy learning about the history of these places. During the past few years, it seems that everything is becoming over-developed. I think that it is important to preserve these old historic places instead of tearing them down to build condominiums and strip malls. The photographs on this page were taken by me in February and April of 2007.